At PURE RAPID, Digital Agency Glasgow we sell marketing services that get businesses more traffic, sales, revenue & profit. We grow businesses and organisations with creative digital, we turn ideas into reality, we find businesses new customers, we give businesses a voice that gets them known to their target audiences. SOCIAL? We create engaging social content for Facebook, Instagram, YouTube & LinkedIn, We manage & grow social audiences, We convert likes, followers & subscribers into revenue. CONTENT? We research, create & strategise content, write compelling copy that grabs, produce pro voice & video content. We have creative Copywriters, Photographers, Videographers, Drone Operators, Cinematographers, Illustrators & Animators. We work with local business to deliver efficient and cost-effective solutions. Our small business sites are geared to generate phone calls, increase sales and boost ROI. Take your business to the next level with a website that will wow your audience. 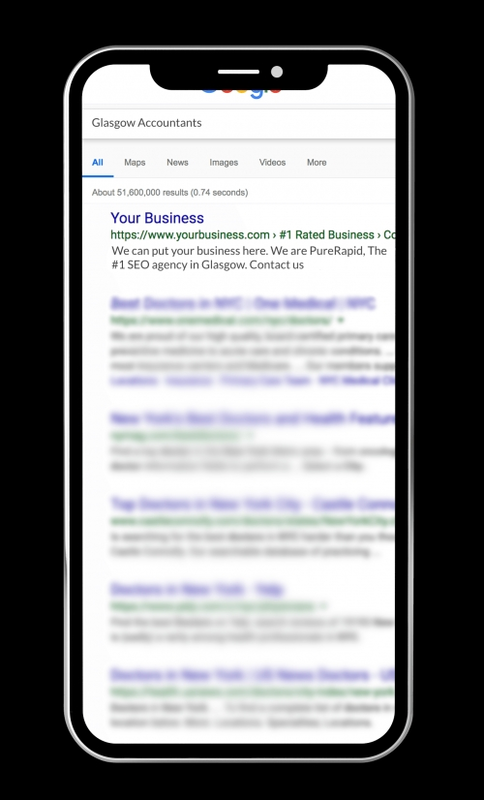 Turn Your Website Into A Full-Time Sales Person Leveraging The #1 Glasgow SEO Agency and find new customers local to Glasgow. We Generate Inbound Leads For Clients Using SEO In Glasgow and beyond. The team carried the project through all of the challenges exceptionally. There are other agencies out there that are cheaper and more expensive, but you can be certain in this teams ability to carry the project as expected. Choose Pure Rapid and you will get what you pay for: Quality, Communication and Commitment. Thank you guys. Pure Rapid provided a really top quality service and project managed me as well as themselves!! Will definitely work with them again.